PacificSport VI offers camps, events, and workshops for athletes, coaches, and the community! Come ride with us! Join one of the Pacific Sport Instructors for a week of road safety, trail riding, getting wet, games and having fun. All levels of rider are welcome! A helmet is required. If your child does not have a bike, no worries! We will work to provide one for them. Ideally a campers bike will have multiple gears for those Nanaimo hills. We recommended kids bring a snack and water. Cost is $30/per child for the five-day week! Early drop-off is available at 8:30am. 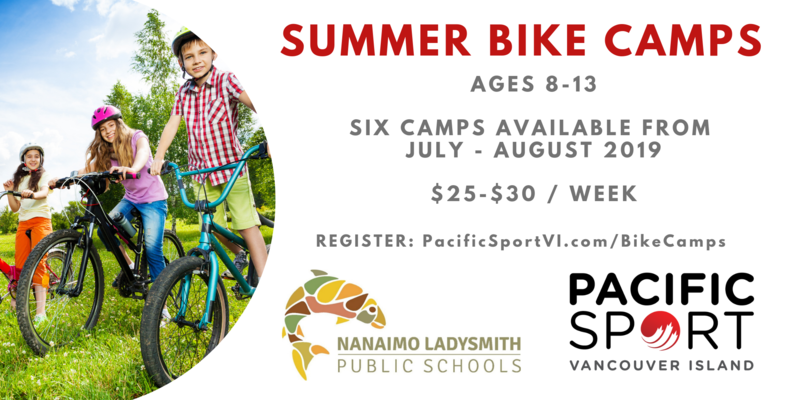 These camps are a great way to introduce your child to biking in a friendly, safe and fun environment. Our facilitators are qualified coaches and deliver top-notch experiences. Please note: Cedar Elementary School is the "Base Camp" for the week, but campers will be riding off-site throughout the day. Other dates/locations are available! Visit PacificSportVI.com/bikecamp to access registration links!